Persons aged 65 years and older comprise only 13 percent of the population, yet account for more than one-third of total outpatient spending on prescription medications in the United States*. 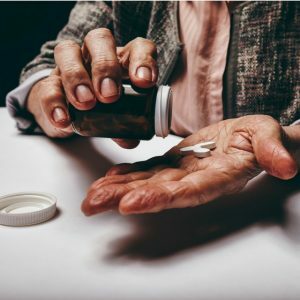 If you are older, or the caregiver for someone that currently takes multiple prescription medications simultaneously to treat different conditions and symptoms, mismanagement of any medication can be harmful and could lead to hospitalization or even death. Create and maintain an up-to-date medication list, including Providers: Keep an accurate list of both prescription and over-the-counter medication and herbal supplements being taken. Include the dosages, dosing frequency, reason for taking the drug, and potential side effects. Keep the list up-to-date and placed in a location that is easily accessible to the patient or other caregivers that are supporting the elderly person. Properly store medication: Make sure the daily pills are stored in a secure, dry location away from light. Refrigerate medications if necessary. Stay true to one pharmacy: To better manage a person’s medication and prescription renewal, use only one pharmacy to obtain drugs. Educate: Confirm that the person taking the medication and the caregiver helping an older patient with his or her medication understands what they are taking, including the name, purpose, effects and potential adverse effects and interactions of each mediation. Dispose of old medications properly and avoid sharing medication. Doctor Visits: When going to a doctor’s appointment, take your medication list, or bring your medication and supplements with you to help your doctor or pharmacist understand what you are taking. This will help them to identify if there are any potential adverse effects you should know. Ask questions: If you have questions about what medication you are taking, side effects that you are having, or any other concerns, ask your doctor or pharmacist. Use tools to help monitor the dosage and dosing frequency: Taking medication several times a day can be confusing. To help an elderly person or the caregiver to manage medication intake, use tools such as a medication reminder chart, check list or a pill organizer box. Keep all medications in one place. Set a schedule for taking medications and if necessary, set an alarm to help you remember. If you, or someone you care for is taking several different medications each day, it can be overwhelming. But if you understand the medication, follow the doctor’s instructions, stay on schedule, and ask questions to your doctor or pharmacist if don’t understand a medication or notice new symptoms/issues when taking your medication, you can prevent medicine mismanagement. What other ways do you or your caregiver do to avoid any mismanagement of medications? Share in the comments below, or join FirstLight Home Care in our conversation this week on Facebook.